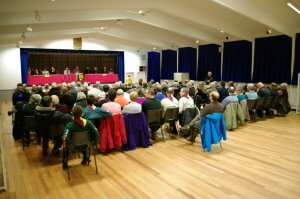 After seven weeks and 27 quizzes, and in front of a packed house of 140 at the Village Hall, the 2014 final turned out to be a rematch of the opening quiz of the 2014 series from 27th January, Willow Brook School versus the U3A. In that opening match the school triumphed by 58 to 54 and the U3A went through as one of the highest scoring losers. Could the tables be turned? In the first semi final, Willow Brook School defeated the Scouts Turkey Trotters by 74 to 39. The Turkey Trotters were only five points behind going into the final bell and buzzer round, but, by trying to buzz in first, unfortunately gave away quite a few points by interrupting unsuccessfully. As well as the usual themed rounds the teams had to recognise various photos of doors from around Keyworth. The second semi final saw the BGS taking on the U3A in the battle of the acronyms. The audience were favouring the U3A to reach their first ever final and the match was neck and neck with the U3A trailing 31 to 33 before the B & B round. BGS, so often winners on the buzzer round, were this time beaten for speed as the U3A came from behind to win by 59 to 51. So the final saw 2013 champions Willow Brook School against new finallists the U3A. The opening two rounds tested the teams on Architecture and the UK Legal System with Willow Brook taking a 22-21 lead. The third round was a picture round with the teams tasked with recognising cities from silhouettes of their skylines. The fourth round was a mini-mastermind round with each team member having to answer six questions in one minute. For the fifth round, the audience were treated to some live music with Brian Lund, Chris Mills and Alex Farran from the Keyworth Guitar Club playing and singing introductions from six songs, the teams having to recognise the songs, the artists and the year they were hits in the UK - great entertainment for the audience. In the final B & B round, we pitted each individual team member against their opposing number for the first half of the questions and, at this point, Willow Brook had a narrow lead of 71-67. For the last 20 questions, though, WIllow Brook went into overdrive to secure a winning margin of 88 to 71, so congratulations to Ly, John, Rosie and Dale and commiserations to Chris, Brian, Ivor and Paul from the U3A. We thank the Parish Council for continuing sponsorship and support of the quiz via the web site; our scoring ladies Pat Jackson, Anne Bellamy and Kath Oakley; our technical wizard Chris Terrell-Nield; our question setter and checker Chris Mills; our photographer for the night John Stansfield; Keyworth News for providing coverage of the quiz, and John Spafford and Paul Turner for writing the questions and being the quiz masters. We thank our audience who continue to turn up and enjoy the evenings and our seven local community groups who make the refreshments each week, including the Twinning Association who do the finals night. We raised over £250 for them to share. Our special guest for the evening was Michael Worth who was the organiser and question master of the quiz from the late 1970s until 1987 with Frank Hanford. Michael handed out the Stuart Bailey Shield and individual cups to the U3A runners up, and the Derek Oakley Cup and individual winners cups to Willow Brook School, our 2014 champions. 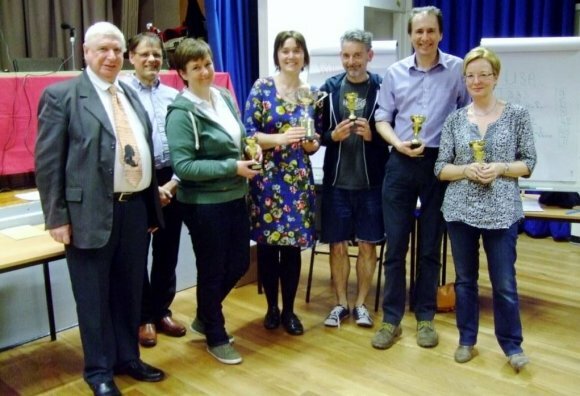 Click here for the full results summary for the Village Quiz 2014. Next year will be the 40th running of the quiz and we look forward to welcoming you all back to the Village Hall in January 2015. In the excitement of the night, someone left a trilby hat behind, and we also still have a glass cake plate from the Sport Relief Cake Sale - please contact Paul on 9147804 if either are yours. Click here for results and fixtures. Quarter Finals night had a slight difference this year as the Quiz audience joined us to help raise nearly £200 for Sport Relief by baking, selling and raffling cakes. In between the selling and raffling, there were four more excellent quizzes. BGS and Keyworth Primary School set the standard with a very even match during the first three rounds. BGS mastered the bell and buzzer round though to win through 61-29. The Friends of Kadzinuni and Scouts Turkey Trotters had an even closer first three rounds and were matched at 29 all before the B & B round. The Trotters are always hot on the buzzers and so it proved again as they pushed on to the winning line with a 54-42 score. The U3A were semi-finalists last year and keen to reach the final this year. They reached the semis again as they led the South Wolds Academy Staff throughout. Rounds on Battles and Generals, and Air Travel giving them a comfortable lead after Round 2 (the school needed a history teacher) and they never looked back to win by 63-34. The final match of the night was a rematch of last year's final between Willow Brook School and the Dramatic Society. The Dramatic Society, looking to avenge their defeat in last year's final, appeared to be heading for victory, leading 36-31 after the first three rounds. Willow Brook came back strongly though and over the last few questions they secured their chance of retaining the trophy with a 61-50 victory. Finals night on Monday 24th March will see Willow Brook play the Turkey Trotters and BGS play the U3A - two excellent matches which will produce an exciting final. As usual, we have some different rounds planned for the finals night. We start the first semi final at 7.30 so please arrive early to secure a good seat. The second week of the Second Round saw the remaining Quarter Finalists decided. Proceedings were also slightly delayed as Quizmaster John had to pop home to see photos of his new grandson, Felix, who was born just before the quiz started. With an audience of over 100 undertaking a series of questions for a "Pointless" style round for the 2015 quiz, we started with a cracking match in which BGS and the Allotments slugged it out until the very last couple of questions. Both teams scored 23 in the bell and buzzer round which meant that BGS held onto their one point lead to go through and face Keyworth Primary School. The Scouts Turkey Trotters knew their stuff on Industrial Disasters and the Armed Forces to defeat the Parish Church who couldn't overcome the need to outscore their nimble fingered opponents in the b & b round. The final winning score was 60-39. The Trotters will play the Friends of Kadzinuni in the Quarters - the battle to see who can have the most impressive mascot! Rounds on Volcanoes and Crime Writers proved difficult for both the Keyworth Dramatic Society and opponents the Local History Society. However, it meant that the match was a tight one with the Dramatic Society overturning a four point deficit going in to the b & b round to win 47-41. The final match of the Second Round saw current champions Willow Brook facing 2009 champions the Methodist Church. An excellent match ensued with both teams on top form. Willow Brook took a lead of seven into the final round where, between them, the teams answered every single one of the 25 b & b questions correctly, Willow Brook reaching the Quarter Final with a 66-55 win, where they will face their Final opponents from 2013 the Dramatic Society. The Quarter Finals night on 17th March will also see us raising money for Sport Relief by eating and raffling cakes made by our audience. So please bring along some change for the cakes and raffle and, if you want a good seat, I advise getting there early - it should be a good night out. March 3rd - the lucky side of the stage? Week 4 of the Quiz was the first of two weeks of Second Round matches. Another audience of approaching 100 saw all four winners coming from the side of the stage on the question master's right – but we aren't superstitious as, in the previous three weeks, the winning sides were evenly matched. The first match saw the highest scoring losers from the First Round, the University of the Third Age (U3A), facing new team, Plumtree Cricket Club. The Cricket Club went in to the bell and buzzer round with a 33-27 lead after rounds on Modern Art and England Sports Managers, but the U3A made a strong comeback to win by 56-45. Quiz 2 was won by Keyworth Primary School with the top score on the night, beating the Tennis Club by 57 to 43. The Tennis Club were surprisingly stumped by the question "What can mean a forum, a sports arena and to woo" with the answer being "Court"! South Wolds Staff versus the Scouts Parents was the closest match of the evening with the Staff winning by 48 to 45 after two tough rounds on Fishing Terms and British Inventions. The final match saw another new giraffe mascot supporting the Friends of Kadzinuni and this one saw the team on great form against the Twinning Association. The first round on people who had 15 minutes of fame in 2013 saw the Friends take a 13-2 lead and they extended this to 36-18 after the two individual rounds. Twinning are always strong on the bell and buzzer round, but could only catch up by six points to give the Friends a winning score of 54-42. Our refreshments were served up by the Keyworth Guides; many thanks to Carolyn and her team. Next week the audience is looking forward to taking part in a quiz to find questions and answers for a Pointless round in the 2015 quiz and, on 17th March, we will be raising money for Sports Relief by selling cakes during the refreshments made by our generous supporters (and at least one quizmaster). If you have a free Monday evening please come along, test yourself against the teams and enjoy the entertainment. Week 3 of the Village Quiz on 24th February saw the final four matches of the First Round take place in front of an audience of nearly 100 - there is, of course, still room for more. The first match was very competitive with the Parish Church leading Probus by two points going in to the bell and buzzer round. The church team had the quickest fingers though and came out on top 56 to 46. The Keyworth Guitar Club were playing one of the favourites, BGS. Despite having a round on music festivals and scoring a creditable 42, they were well beaten by the BGS team who made the highest score of the night with 68. BGS now go on to meet the Keyworth Allotments team who were the highest scoring team from the first round. John Beeton was a stalwart of the quiz for many years, organising the Rugby Club team and being our official photographer. Sadly, John died in 2013 and the club needed a new team captain and squad. Thankfully, Rob Severn stepped up and brought his new lads along for their first match. It is always a test for newcomers to be on the stage in front of a big audience, but the team put up a solid show. A 60-36 loss to the Methodist Church was a good performance against the team who won the title in 2009 and look strong again this year. This quiz provided the best wrong answer of the night. To the question "Where do the Keyworth Photographic Club meet" the Rugby Club suggested "In a dark room?" The final match saw the Olde Peculiars Golf Club taking on the Tennis Club. The Olde Peculiars are a group of golfing friends who get together once a month for a round of social golf. Their laid back style was a disadvantage against a strong Tennis Club side who powered to a 64-23 victory. Our refreshments were kindly served by the ladies of Keyworth Community Concern. All the takings from the refreshments and donations at the end of the quiz are shared between the seven teams who undertake the refreshment serving. This year, we are raising money for Sport Relief which falls during the Quiz run. Rather than do anything too energetic, we have asked our audience if they will make cakes which we can sell by the slice or whole on our quarter finals night on March 17th. We already have lots of volunteers, so if you want to enjoy a fun night out and eat cake too then come along. The second round matches are now all arranged - see the results and fixtures link. There are some very tight quizzes expected on the 3rd and 10th March including newcomers Plumtree Cricket Club taking on 2nd highest scoring losers, the U3A. Last year's winners Willow Brook School have a very tough match in prospect against the Methodist Church and their new mascot Wesley. February, 3rd - High scoring in the Village Quiz! The second week of this year's quiz was played on 3rd February in front of almost a full house - is it due to this website, or our recent coverage in both the Nottingham Evening Post and on Radio Nottingham?! Our first match saw a very strong performance from the staff of South Wolds school against the retired Badminton stars of the Four Feathers. The Feathers scored a very respectable 48 points which is often enough to win a match, but their hopes of a high scoring losing team's place in round two were soon to be dashed. Our audience really enjoyed a titanic struggle when the Friends of Kadzinuni came from behind to catch the Keyworth Primary school on the very last question to force extra time with a 55 all draw. The school parents and staff were inspired on the extra five questions, answering them all to go through as winners. But their score of 55 points puts the Friends in pole position for one of the two highest scoring teams to go through. Our first new team this year, Plumtree Cricket Club, showed that they are a team to be feared, with a very convincing win over the gallant Baptist Church team. The Cricketers achieved a score of 65 points, which equals the highest so far this year, but that record didn't last for very long as the Scouts Turkey Trotters bettered that with a 70 point haul against our second debutants, the Nottingham Astronomical Society. In the final match of the evening, our hardworking medics had to give way to an incredible performance from the Keyworth Allotments who notched up the highest score in quiz memory with an astonishing 82 points (hope our arithmetic was right!!). The medics always enter into the spirit of the quiz and when they were unable to recall that Hansen's disease is the technical term for Leprosy, we were assured by the Doctors that they haven't had to deal with too many cases of that terrible disease lately in Keyworth! We're sure that we're in very safe hands with our medics, we'd much rather they kept up to date with the Lancet rather than reading quiz trivia! The Allotments team put their success down to the recent wet weather as they haven't left their strength on their plots catching up on their winter digging. Our refreshments were served by the Ladies of the Royal British Legion who are always ready to help out at the quiz. We now take a break with the Blood Donors using the Village Hall next week and then half term the following week, so we'll be back on Monday 24th February at 7.30pm - hope that you can join us then. 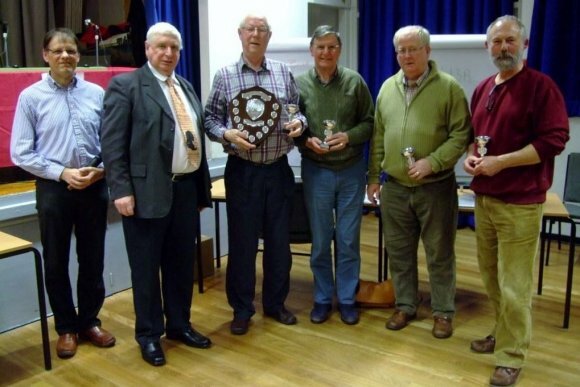 The Village Quiz started its 39th consecutive season on 27th January. The event was opened by Stuart Bailey, who is both a previous winner in the quiz and was also the questionmaster for no less than ten years. Stuart has also donated one of the two permanent trophies for the quiz. Stuart really appreciates how much preparation work is needed to make the quiz a success and he calculated that over 55,000 questions have now been asked over the lifetime of the event. The audience enjoyed some very close matches on the opening evening. The very first match between the current champion Willowbrook school and the U3A was a repeat of a semi final last year, and in a very high scoring encounter the school showed that they are not going to relinquish the cup without a real battle. With two new players from last year, the school came from behind with a very strong performance in the Bell & Buzzer finale to claim a very narrow victory. There are two second round places available for the highest scoring first round losing teams and with a score of 54 points it's very likely that we will see the U3A team again this year. There were also wins for the Scout Parents, the Keyworth History Society and the Twinning Association, the Scouts Parents just edging Crossdale Drive on the very last question. The South Wolds Students are always a very welcome addition to the quiz and they did very well on a round all about the internet, before the History Society overtook them on the Bell and Buzzers. We always try to include some topical questions from the news each week. This week included "What have the keepers at Paignton Zoo banned monkeys from eating?" - amazingly the answer is bananas as they are too "sugary" - and also "Why was the start of the Syria peace talks moved from Geneva to Montreux last week?" You may have heard that the venue in Geneva was unavailable due to a convention of Swiss watchmakers. Everything in Switzerland stops for the watchmakers! The Quiz seems to be attracting media attention this year (perhaps due to this website!). In the last week, we have been covered in the Nottingham Evening Post, with photos of the Willowbrook school and South Wolds Students teams, and Radio Nottingham came to the opening night and made a report which was aired in their breakfast show the following day. A variety of people behind the quiz, competing in teams and members of the audience were all heard on air. The intervals on quiz nights are always a super time to catch up with folks you haven't seen for a while. Our refreshments were served by the Keyworth cubs helped by some of their parents. Do come along and enjoy the entertainment. The next quiz night is on Monday 3rd February, when we have an extra match and we start at 7.00pm – come along and see what you've been missing. XHTML 1.0 validated. WCAG compliant. Page generated in 0.1349 seconds.